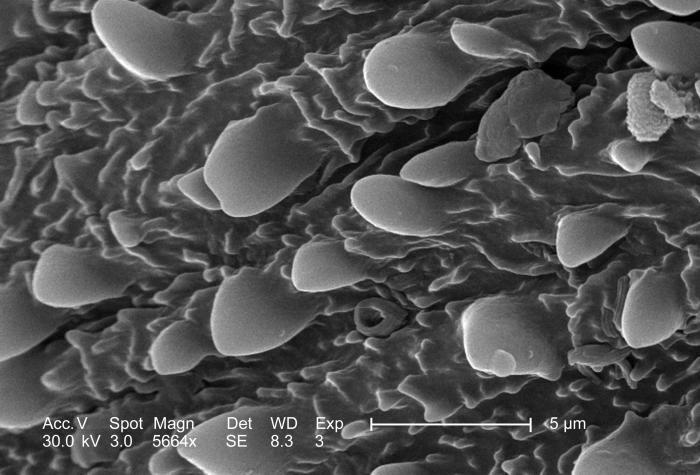 This scanning electron micrograph (SEM), highly magnified at 5664x, revealed the ornamentally adorned exoskeletal surface of an unidentified insect. The exoskeletal section was from the region occupying its inferior abdomen. Overall, the insect was described as being black, and its black wings were patterned with longitudinally oriented red stripes. It measured approximately .25 inches, and was found deceased on the ground of the Decatur, Georgia suburbs.